This matter deserves it's own thread, so I have copied the initial comments to a new venue. Fraud is very upsetting. It is usually related to some form of money grabbing. So is paradigm shift. It is usually related to some form of entrenched money grabbing that doesn't like the change. Andrew, there's really not much new about the globe warming: it has been the case for the last 20,000 years. Not really a paradigm shift. What is new is the political hype, the disingenuous hockey stick by Michael Mann, and the bastardization of datasets to make political points. This is not science. Bravo! I nearly did this yesterday, good call. I've been reserved on this as I never wanted to get into the politics here, really, or interfere with TIGHAR's efforts at the mission... but I have to admit that with the 'science in' on it, yes - the earth has a breathing life of its own, and our influence is... overblown IMO. I do see value in understanding our physical environment - which does change (cooling over last several years, I believe), and believe we should be responsible stewards. But all the hype we've had dumped on our heads by those who've intimidated and contrived is no more than a rip-off and power grab, IMO - scare tactics to fleece us as far as I am concerned. ... and the whole climate change thing seems to upset a lot of people. Based upon the above, I take it that you believe that climate change is a fraud, yet you then go on to say that global warming has been going on for 20,000 years. Once again you display an inconsistency in your position, while offering nothing substantive to back up anything you are proposing, fraud or 20,000 years of global warming. So which is it, and let's see what you back it up with. Based upon the above, I take it that you believe that climate change is a fraud, yet you then go on to say that global warming has been going on for 20,000 years. Mr. McKenna, Tim Mellon said, "Andrew, there's really not much new about the globe warming: it has been the case for the last 20,000 years." With respect, I did not take it as him saying that "global warming has been going on for 20,000 years", but global warning has been a case for that period of time. That seems to me, not to be a statement that it has 'been going on'. Can't speak for Mr. Mellon but that is the way I took it. In any event, I believe that it is far too polarizing to be part of the focus of another expedition on Nikumaroro. And further, Andrew, CO2 has only been spewing into the atmosphere for less than 200 years. The cause of warming lies elsewhere, possibly sun flare cycles. The fraud consists of assertions that global warming is man-made. We have 'climate change', no question; there can be many reasons for it - many contributors, large and small. What I tire of is the "Chicken Little" assertion - that man has somehow single-handedly triggered some dooms-day event, and that life as we know it must grind to a halt - economies knocked off their petro-bases overnight, etc. to "save the planet". None of that means I don't favor understanding our climate - and its very real changes. I also don't particularly object to this being studied at remote places like Niku if resources can be shared advantageously with those who do such things, etc. But it is not a primary mission for TIGHAR, as I see it - and I just don't buy the hysteria that so often has gone with the topic. Interesting perspective, Chris - with real experience. I don't doubt we emit harmful stuff and should curb pollution, etc. - nor do I deny the need for real study. The problem I have is with runaway assumptions - as you pointed out, we lack hard data to prove much about this, so it is hard to know what to focus with urgency on, etc. Acid rain wasn't alleviated overnight but had to be understood and dealt with in a way that the economy could swallow. Same with these other things. Chris, I think you have a valid point. Petroleum is a passing phase, and I think we will sooner run out of its need before we run out of its supply. Hydrogen, graphite, fusion and many other advances will propel mankind beyond the internal combustion process before the end of the 21st Century. The Malthuseians (and your Ludites) just don't get it: mankind has the ability to invent its way out of any problem, so long as the politicians keep their crooked little noses out of the process. I just trying to get a grip on where you guys stand. It doesn't make you wonder about whether or not the change is related to mankind's use of fossil fuels, i.e. man-made? Not even a little bit? Or is NOAA just part of the "fraud"? 1. The data now apparently shows that the world has actually been in a slight cooling trend for the past 18 years. 2. My own hunch is that the climate is largely affected by the sun-spots. Even Eric Holder can't do much about that. 3. The CT Dept of Environmental Protection published a study years ago showing that during the last Ice Age, the Ocean adjacent to Connecticut was 450 feet lower than it is today. The weight of the ice (over a mile thick) pushed the CT shore area down over 100 feet. 4. The NOAA graph goes back but 300 years. 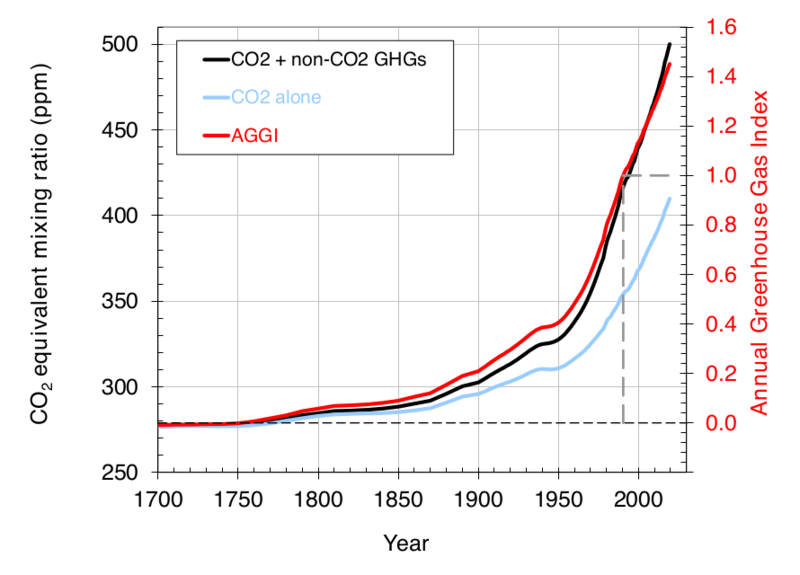 The CO2 has increased only 50% in that time. There was a time 500 million years ago (can't remember the name of the Age, but you can ask the Dept of Interior) when the concentration of carbon dioxide was over 100 times it's current concentration. Yet Nature has survived nicely. So NOAA is not part of the fraud; just those who insist that the data in their graph proves that man is responsible for global warming. Tim gives a sensible summary to me of what this is really about, and a bit more insight than we'll get from the fear mongers to boot. I respect the NOAA data - but that is all it is, 'data', which is akin to what Disraeli warned us about concerning statistics: take care lest they simple be made to say what one says they are. I have no doubt that rising CO2 levels have a 'greenhouse effect'; I have great doubt that man alone is anywhere near responsible for what we have seen. The cooling trend Tim mentions is also demonstrable, as I understand it. Nature remains a far greater force than man, to wit the time in the past with carbon dioxide extremes far greater than we're seeing today (vulcanizing?). BTW, the sun is hotter than usual - I don't see that factor among the NOAA data here, for one thing. So while I'm sure NOAA has wonderful data, I look at the set and find it wanting for the sake of this discussion - where, fairly, are the other factors that also affect global temperatures? I won't call NOAA fraudulent, I don't know that they are - but I call that chart flawed if one wishes to use it to prove that man is causing these changes. At the end of it - I don't dispute science - but that is the point: we've gotten way too much noise that has been involved in hijacking the science to its own ends and attempting to create what amounts to panic. We're not getting enough unfettered, quiet science to fully understand the changes our planet is undergoing. The earth has its own complex cycles as it exists in a complex universe - and I'm not overly alarmed at the changes - as Tim pointed out, nature adapts - so must we, as real changes come. Yes, some short term effects may be harmful to our existence - but man is quite adaptable. What I think we don't need are a bunch of half-assed hysterics hi-jacking the science and running our economic system into the ground to drive us all into mud huts and onto ox carts pulled by ants. That's where I 'stand', if it's important. No, they do not. That canard is solely based on the fact that 1998 remains the warmest year on record, disregarding that it was an El Nino year (which causes extra heating). Nine of the ten hottest recorded years have happened since 2000, and the total heat balance of the world (which includes the atmosphere and ocean) has increased. I'm not going to address this, except to point out that taking one cherry picked data point is a poor way to discuss this topic. The argument that "the climate always changes, therefore we have nothing to do with the current heating" is spurious. The Earth was undergoing a long cooling cycle, which has rapidly reversed in the past 100 years; the only change in the atmosphere that wasn't a "natural" occurrence is our dumping of CO2 into the atmosphere. The Sun has nothing to do with this. The only large source of heating left is human. And, the idea that it's a fraud is ludicrous. Thousands of scientists would have to be in on it, from nations all around the world (including US enemies). It's just not a credible argument, but it's made in an attempt to undercut the science data that opponents don't want to look at in totality. Also, scientists aren't in this for the money, the resources they get to do research are just enough to do the research; very few of us make enough to become wealthy. A vast amount of money is involved in the oil economy, and keeping that dominant is a much more lucrative endeavor, which means a very large monetary incentive to undercut anything that would challenge that. That's why we see states like Oklahoma trying to stop solar power, because the oil lobby got them to pass laws. Somehow, people think that scientists have a larger financial interest in this than the oil industry, which is just flat wrong. In the end, physics doesn't care what you think, it will do what it will do, and if you ignore it you will end up paying. Any kid who does something stupid and falls down knows this. Ignoring the heating, or pretending it's not happening, or attacking the messengers, won't matter when the ocean rises and Niku ends up underwater. Did I mention 20,000 years, not just 50? I guess the Little Ice Age is myth and/or spurious. Even having a cushy research job is incentive enough, forget about becoming wealthy. Don't forget, Niku like most volcanic islands, is also sinking. So is Connecticut. So, in fact, is the whole East Coast of the United States. Few of you scientists give this phenomenon due credit. In fact, Dr. Riddle, Michael Mann is just the visible tip of a melting iceberg, mixing datasets to his own liking, and essentially abandoning the scientific method. He and you and I probably won't be around for the onset of the next Ice Age, but as sure as shooting it is on the way. Then you can go back to studying "Global Cooling" the way you did in the 1970s as a reaction to the possibility of a Nuclear Winter. Government funding will flow without interruption.